Benjamin K. Sovacool, Roman V. Sidortsov, & Benjamin R. Jones, Energy Security, Equality, and Justice, Routledge, 2014, xix + 213 pp. This book is a recent product of the Vermont Law School’s Institute for Energy and the Environment’s research on how to ‘equitably provide available, affordable, reliable, efficient, environmentally benign, proactively governed, and socially acceptable energy services to households and consumers’ (p.xvii). The aim of this book is to describe current inequalities and injustices associated with energy use and make suggestions as to how greater justice might be both understood and achieved. As the first chapter points out, we are drifting ‘into a future threatened with climate change, rising sea levels, severe pollution, energy scarcity and insecurity, nuclear proliferation, and a host of other dangers’ (p.1), and our desire for low-cost and reliable energy conflicts with the pursuit of the sustainable and cleaner environment that we also wish and need to experience. The chapter provides enough evidence for these statements. and an affirmative principle: ‘if any of the basic goods to which every person is justly entitled can only be secured by means of energy services, then in that case there is also a derivative right to the energy service’ (p.46). Because a sustainable and clean environment and a stable climate are basic goods to which we are all entitled, the prohibitive principle requires that the damaging externalities associated with energy production must be minimized. Anyone who doubts the environmental and climate damage being done by the ways in which we currently produce energy should read chapter 3. The damage done to health by fuel poverty in the UK and elsewhere, and the volatile and increasing cost of carbon, are described in chapter 4 – John Hills’ Getting the Measure of Fuel Poverty ought to have been referenced. In chapter 5 the socio-political dimension is described in terms of corruption, authoritarianism and conflict, which are as problematic in the so-called developed world as in the developing world. Chapter 6 charts the disproportionate way in which the poorest communities fail to benefit from energy production and at the same time suffer the most from production methods. Chapter 7 describes widespread environmental damage and finds that the extension of conventional technologies can only increase inequality. The impression left by this book is of ubiquitous environmental damage and fuel inequality, that is, damage and inequality in the world’s wealthiest as well as in the world’s poorest countries. The answer is not new technologies: the answer is to ask who is affected by investment and pricing decisions, and to factor in the externalities when relative costs are calculated. If this is done, then solar and wind power turn out to be both more just and cheaper than nuclear power or fossil fuels. The problem is therefore a political one – a fact that could have been made more explicit in the book’s concluding chapter. This book should be read alongside Fitzpatrick and Cahill‘s Environment and Welfare: Towards a Green Social Policy (Palgrave Macmillan, 2002), in which Tony Fitzpatrick suggests that a citizen’s income could encourage economic growth and therefore greater environmental damage, and James Robertson proposes a carbon tax to fund a citizen’s income, which would encourage renewable energy production at the same time as promoting income justice and therefore fuel justice. It should also be read alongside the recent Institute for Fiscal Studies’ report Energy use policies and carbon pricing in the UK which recognizes that an increased carbon tax is needed on domestic gas use and that this would require poorer households to be compensated. The acknowledged problem here is that such a compensation package would require an increase in means-testing, which would impose additional disincentives, administrative complexity and income volatility on those households least able to cope with them. 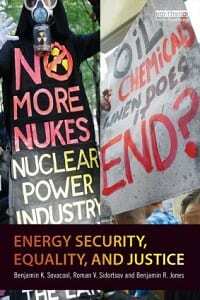 Energy Security, Equality and Justice lacks a bibliography, which is a pity, and its index is sketchy, which will make the book difficult to use as a reference volume. But it is a well argued and carefully evidenced discussion of issues vital to our future and it deserves a wide audience.